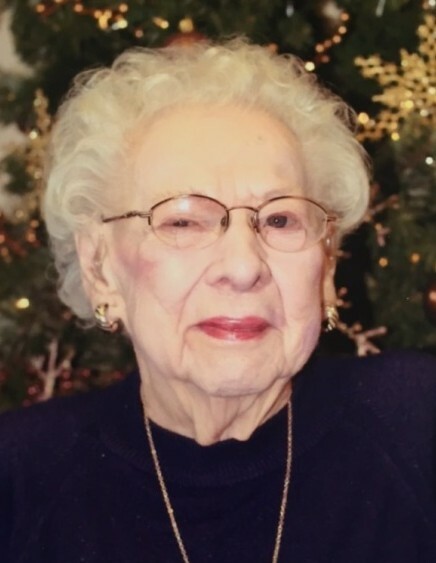 Elizabeth "Betty" Lillian Summers, 103, of DeWitt, Iowa, was called to our Lord Sunday morning, March, 24, 2019. She was surrounded by family and peacefully began her journey at Westwing Place in De Witt. She was the middle child of seven born to the late Nicholas and Clara (Greten) Kremer on August 15, 1915, on the family farm in Cascade. Betty graduated from St. Mary High School in Cascade and Pitzey’s Beauty School in Waterloo. Her father was a cattle buyer and she remembered getting up, sometimes in below zero temperatures to milk cows before walking to school. After school it was back out to the field to bring cows in and milk again. There was always something to keep the kids busy: chores, gardening, and of course playing with each other and pets. Betty's early childhood laid the foundation for her lifelong work ethic. After graduating from Beauty School, she worked in Decorah and Davenport before moving to DeWitt in 1940. Betty worked with her friend, Edna (Erickson) Keiner until World War II broke out. Keiner left DeWitt to be with her husband who was stationed in the South and Betty bought the beauty shop. It was during this time that she met her future husband, Merle "Skeezix" Summers. They were married on August 29, 1946, and to this union three children were born. Betty eventually moved her beauty shop into their home. In all, she worked over 60 years as a beautician retiring at age 80 at the suggestion of her children. Betty had a great rapport with her customers and enjoyed visiting with everyone. She always said she heard a lot of gossip but her children attest to the fact that what she heard wasn’t repeated (at least not where they could hear). Her husband Merle preceded her in death March 26, 1997. A lifelong Catholic, she was a member of St. Joseph Parish for 79 years. Betty served on the Altar and Rosary Society. Her faith was strong and maintained her through good times and bad. Betty always had a rosary by her side and prayed the Hail Mary over and over during her stay at Westwing. Missing Sunday Mass was not an option for her or the family and she had a ready supply of holy water, holy candles, and palm fronds to be burned or sprinkled at the first indication that bad weather was a possibility. During Betty's last years she was always sure to ask when Mass was going to be held at the nursing home. Betty was an avid card player, especially 500, belonging to two card clubs, and always up for a game of cards with family and friends. She taught her grandchildren the rules of the games never letting them get an unearned victory. In later years, Betty spent many hours playing solitaire “until she wore the spots off the cards”. Her hobbies also included crocheting, embroidery, reading cookbooks, and watching sports - especially the Hawkeyes and the Cubs – never hesitating to express her opinion about their management, coaches, or players. Ironically when the Cubs won the World Series, Betty couldn’t comprehend the magnitude of the event. She was a member of the DeWitt American Legion Auxiliary for more than sixty years serving as Sargent At Arms for many of those years. As was the case for Betty and most of her “Greatest Generation,” patriotism and service to country was important. A lifelong Democrat, she wasn’t shy about sharing her opinions about by whom and how the government should be run which often made for some lively family debates. Betty was a wonderful cook having learned at the side of her mother. No matter how busy she was in the “shop”, there was a hot meal waiting for her family at suppertime. Many of Betty's recipes are included in local church and other organizations’ cookbooks. The most important things in her life were faith, family, friends, and her farm upbringing. Betty was a loving mother making sure her children lived by her Golden Rule – do unto others as you would have them do unto you. Her home was a welcoming place for all and her table often seated friends of her children, as well as other family members and friends who might stop by. Those who cared for her at Westwing can attest to her sense of humor, feistiness, and story telling ability. Not to mention the occasional assist with hair braiding or a cooking lesson. Betty's longevity is a testament to those qualities. She outlived her spouse, all her siblings, most all of her friends (which required making new friends who she usually outlived), and other than her immediate family, most of her generation’s family members. Betty was the repository of family memories having the ability to remember birthdates, aunts, uncles, cousins, their occupations and children. Even Bill Homrighausen "Mr. DeWitt" consulted her for information. Left to cherish her memory are her children, Gayle (Mark) Nelson of Iowa City; Bob (Bonnie) Summers of DeWitt and Bill (Mary Claire) Summers, Des Moines. The matriarch of a family spanning five generations, she leaves eight grandchildren, Rob (Shana) Roggeveen, Lissa (Todd) Alton, Zach (Tina) Summers, Josh Summers, Mike (Christine) Summers, and Elizabeth, Tucker and Tyler Summers; eleven great-grandchildren and two great-great-grandchildren. Betty also leaves several nieces, nephews, and friends who mourn her passing. Also preceding Betty in death were six siblings and a great-grandchild. The family will receive friends at St. Joseph Church with a Rosary at 12:00 noon and visitation from 12:15 noon until 1:45 p.m. Wednesday, March 27, 2019. A Funeral Mass will be held at 2:00 p.m. Wednesday in the church with the Rev. Fr. Stephen Page officiating. Burial will follow in the church cemetery. Memorials are suggested to the DeWitt American Legion Auxiliary or Westwing Place Nursing Staff. Pallbearers will be Rob and Jack Roggeveen, Lissa and Todd Alton, Zach and Josh Summers and Mike and Elizabeth Summers. Honorary pallbearers will be Tuck and Ty Summers, Henry Summers, Audrey, Isaac and Isabel Lee, Leigha and Ella Roggeveen, Dominic and Eden Summers, Madyson and Aiden Summers and Allie and Emme Alton. The family would like to thank Dr. Craig Champion and Dr. Steve Fowler for their patience and compassionate care over the past several decades; the Westwing and Genesis staff especially the nursing staff (in particular the CNA’s) who lovingly cared for our mother for the past 5 ½ years; the pastoral care members from St. Joseph; the many volunteers and friends who called on our mom or assisted her with games, crafts, and mail while at Westwing and our family and friends who called on, prayed for, or otherwise cared for us and mom. Memorials may be made to "DeWitt Community Hospital Foundation" with a designation to Westwing Place noted in the memo line of your payment.